Stone Soup is a wonderful children's book. I, like many of you, have read the book to your children. The story is simple. A stranger helps a small town make soup together. By working together, everyone makes a delicious soup. Now the well-known book, Stone Soup, is a cooperative game from Peaceful Kingdom. What is a cooperative game? These games have the players play against the game, not each other. The game's emphasis is playing not competition. Cooperative games build confidence, encourage inclusion, and teach kids to share. Stone Soup, the game, has children work together to "cook" a soup. Children match the soup ingredients. The goal is to fine all the ingredients before your fire goes out (you turn over all the fire out cards). The game is simple to play and no reading is required. This cooperative game enhances the following learning skills: memory, social development, helping others and cooperation. My boys have been playing Stone Soup. It's easy for them to play without direction. For example, I have them play while I was putting up Christmas decorations. There was no fighting over who won or lost because the goal is to beat game, not each other. 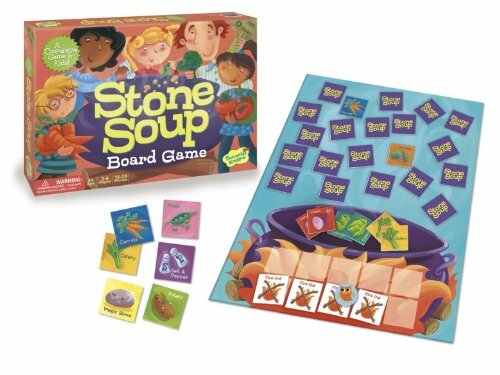 Stone Soup is available at Amazon.com for an estimated retail value of $15. Peaceful Kingdom offers many other cooperative games including Count Your Chickens, Hoot Hoot Owl, and Fish Stix. All of these games can be purchased on Amazon.com. This holiday season give your kids a game that will build a confidence. Put Stone Soup from Peaceful Kingdom on your holiday shopping list. 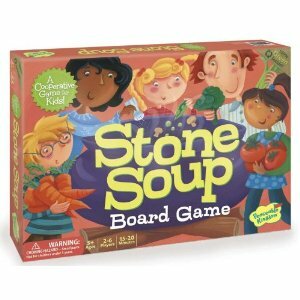 Disclosure: I received Stone Soup to review. All opinions are mine and were not influenced by any person or entity. For my complete disclosure policy, please visit www.more4momsbuck.com/disclosure.